Demi Lovato Reveals Why She Posted Pics of Her Cellulite and Other "Flaws"
Demi Lovato wants her fans to know that no one's perfect, and that's OK.
Last week, the 25-year-old singer and body positivity advocate shared some pics and videos of parts of her body, including her cellulite and stretch marks, adding, "No thigh gap for me and yet I still love myself." "I was on Instagram and I started comparing myself to these Instagram models and I just thought to myself, someone needs to show my fans and anybody that's looking at my account that what you see isn't always what's real," Lovato told E! News exclusively. "And so, I decided to embrace my flaws and—I don't even like to call them flaws, it's just a part of who I am—and show the world that I'm imperfect, but that's what makes me beautiful." 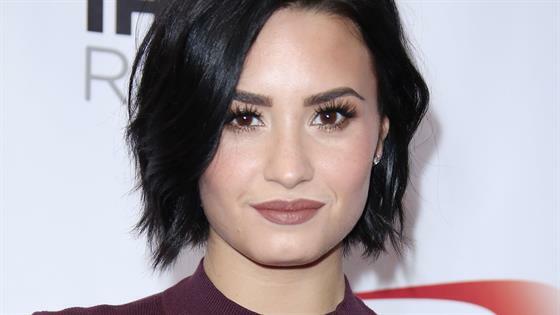 Lovato had for years battled an eating disorder. She has often slammed the "thigh gap," a growing trend among dieters in recent years, and promoted body positivity among her fans. "What I would say to somebody who's struggling right now, is try to find the gratitude," Lovato said. "It's so important that you try to find gratitude in your life and focus on the positive things and when you're able to do that, or you're able to help others, you're able to get outside of yourself and you're able to look at your life from a different perspective. Sometimes it's really challenging and it's really difficult, but it's something that helps me every day, and so far it's worked." Lovato also talked to E! News about her eating habits, saying she no longer diets. "I think that dieting is something that we've been forced to kind of do because of the diet culture...we're praised if we don't eat fried chicken and we eat a salad. It's like, sometimes that's what you want and it's OK to treat yourself every once in a while." She said her favorite "cheat" foods are SusieCakes, birthday cakes, brownies and cookies. Lovato is currently on tour and keeps healthy while on the road by staying hydrated—she's a fan of CORE Hydration water—eating healthy and working out. She says she enlists the help of a personal trainer and also brings along a nutritionist.